Welcome to our August edition. The monsoon season is in full swing and it augurs well for the Indian Economy. While celebrating the holy month of Ramadan, Advance Valves conveys its good wishes to all its readers for Ramadan Kareem. Advance Updates its UL Listing! We are pleased to announce that we have recently concluded successfully UL listing tests for the 20” and 24” Concentric Butterfly Valves for usage in fire – water systems. 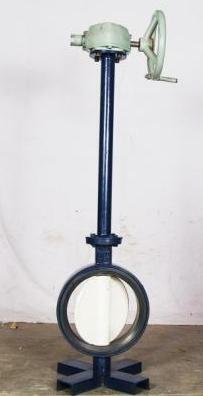 This is the latest addition to our UL approvals which now comprises of valves from sizes 3” to 24”. Adding to that, we have received the UL Certificate for the valves with Extension up to 5m for each of these sizes. For details on the UL Certificate please visit the following link and search for Advance Valves. http://database.ul.com/cgi-bin/XYV/template/LISEXT/1FRAME/index.htm. The UL certificate covers the application of valves in the Fire – Water system. This testing was conducted by Underwriters Laboratories Inc. Underwriters Laboratories® is an independent product safety certification organization that has been testing products and writing Standards for safety for more than a century. The UL mark is one of the most recognized, trusted and accepted safety symbols in the world. The UL Mark is recognized as one of the apex product certifications which validate not only product design but also performance through extensive testing under severe conditions. UL tests samples of products to safety requirements and conducts periodic checks of manufacturers' facilities. In other words, it is an assurance that steps have been taken in the interest of safety. Using UL listed products is mandatory in some regions and some of the high-end Oil & Gas industry users to maintain the safety standards, while also ensuring financial security. UL approved Butterfly Valve with and without Extension is a protection against liabilities to the project. Advance Valves is amongst the very few valve manufacturers globally, and the first Indian company to have obtained UL listing for the Butterfly Valve category. Advance Valves Balancing Valves segment, which caters to the HVAC segment, have been receiving the confidence in contractors and users in all the domestic markets. We have recently joined hands with Fratelli Pettinaroli Spa (http://www.pettinaroli.com) for supplying Pressure Independent Control Valves (PICVs) and this has contributed in enhancing our stronghold across the complete range of balancing requirements. 1. 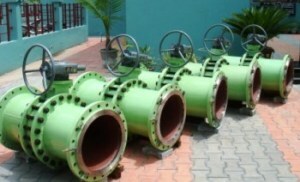 Prestige Shantiniketan: It is a township in Whitefield, Bangalore and Advance valves has successfully supplied 400-600 mm Large size Balancing Valves for the HVAC requirements. 2. TATA Coke Oven Project: Advance Valves will supply the 350 -400 mm Large Size Balancing Valves for the TATA coke oven project at their Jamshedpur facilities. The 13th edition of ACREX India to be held from 23rd to 25th February 2012 at Bangalore organized by Indian Society of Heating, Refrigerating and Air Conditioning Engineers (ISHRAE) with the professional expertise of Nürnberg Messe (NM) and Bangalore International Exhibition Services. ACREX India 2012 offers a perfect PLATFORM for Air Conditioning, Refrigeration and allied Building Services. 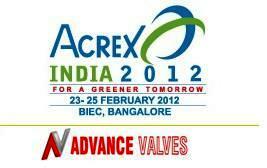 Advance Valves, as a Silver Sponsor, is proud to be associated with the India’s premier exhibition for HVAC segment. ACREX is the largest privately organized exhibition (as per ITPO) in India.